Of the ten industries that tend to issue the highest quality preferred stocks ("CDx3 Preferred Stocks"), four are now in a position to introduce new issues thanks to the massive market price increases that we saw throughout May 2009. The Last Month's CDx3 Investor Results article shows you a chart that illustrates where each industry stacks up in their ability to issue new CDx3 Preferred Stocks and how far away they are from being able to do so. Not surprisingly, hotels have a long way to go; but you'll never guess where Big Banks ranked. I research the market price behavior of the highest quality preferred stocks and write to you about my observations. The Special Announcement article announces the availability of the new Preferred Stock Investing Reader's Forum where I post short articles throughout the month in plain English for non-experts. You can even receive new posts to the Forum directly and automatically into your email inbox without having to visit the Forum web site itself. In the CDx3 Company Spotlight article I introduce you to apartment developer and operator UDR, Inc. With the housing market in a major slump, apartments have enjoyed high occupancy and low turnover rates. Founded in 1949, UDR is an issuer of CDx3 Preferred Stock. The CDx3 Question of the Month this month addresses a question that I am receiving with increasing frequency. Citigroup's upcoming preferred stock conversion, which is probably the largest single such conversion in history, has created opportunity for some, anxiety for others and confusion for all. I provide you with a link directly to the May 13, 2009 SEC filing plus a table that cross-references your Citi preferred stock trading symbol to the (incredibly unhelpful) obscure trust name references used throughout the filing. Coming Up For Preferred Stock Investors: Look for Citi to implement their historic preferred stock conversion during June. Secondly, watch for new and/or modified capital generation plans from the Big Banks. Just within the last week or so Regions, Fifth Third, Bank of America and SunTrust all announced plans that involve the conversion of preferred stocks to common shares to one extent or another. While preferred stock conversion is being used by many of these financial institutions to boost capital postitions, I am pleased to report that CDx3 Preferred Stocks have been left intact; not one share of CDx3 Preferred Stock is being required to convert to any bank's common stock and all CDx3 dividends remain unscathed as well. It pays to invest in the best. Maybe it's time that you become a CDx3 Notification Service subscriber. And watch for the SEC to announce its new plan to thwart "predatory short selling," a dishonorable practice that, had the government not paused the practice last fall, could have very possibly led to a run on many of our nation's largest financial institutions. For three straight months, massive amounts of investor cash have come out of safe havens and poured into high quality corporate bonds and preferred stocks, with the highest quality issues setting new records. The market prices of the highest quality preferred stocks – CDx3 Preferred Stocks – rose by a record amount during May 2009 (as measured by the CDx3 Perfect Market Index, Preferred Stock Investing, page 80). During economic recoveries, the stock market usually recovers first since investors are motivated to get in on a recovery early; employment is usually last to benefit since employers are hesitant to take on the commitment of new employees; and real estate usually starts to recover somewhere in the middle, when buyers finally regain enough confidence to take advantage of low market prices and low interest rates. Preferreds As Early Warning System: The market prices of the highest quality preferred stocks can, therefore, be used as an “early warning system” of a recovery. As cash comes out of safe havens and into high quality preferreds, market prices will go up, which is exactly what has been happening for the last three months. Market prices for CDx3 Preferred Stocks started edging up in March, gained momentum in April and really caught fire during May. 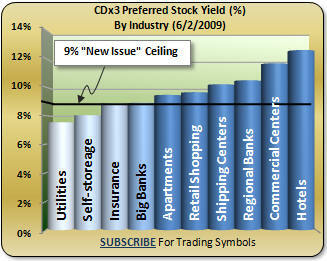 One of the indicators that I watch very closely is the yield offered by groups of CDx3 Preferred Stocks. The yield is the rate of return that you are earning on the money that you actually have invested. So if you can buy into an investment at a lower price, your actual return – your yield – goes up since you do not have as much of your money invested. As the price of an investment goes down, your yield goes up. The reverse is also true. As prices move up, yields move down since you have to pay more to get a piece of the pie. So by tracking yields on the highest quality preferred stocks, which are among the first investments that benefit during an economic recovery, we can actually watch the recovery begin. 9% New Issue Ceiling: Historically, the declared dividend rate offered by new CDx3 Preferred Stock issues ranges between 6.5% and 9.0% (Preferred Stock Investing, page 189). Paying out more than 9% in dividend expense is just too expensive for issuing companies, so we can think of 9% as a “new issue ceiling” above which new issues just do not happen. The current all-time record holder for the highest declared dividend rate of any CDx3 Preferred Stock pays 8.95% (see Preferred Stock Investing page 38 for trading symbol). This chart shows the dividend yield of CDx3 Preferred Stocks by industry. There are now four industries that can get away with bringing a new CDx3 Preferred Stock to market – utilities, self-storage facilities, insurance companies and, for the first time in over a year, Big Banks (although they are currently awash with TARP, depositor savings and other cash). While the 32 CDx3 Preferred Stocks offered by our Big Banks have realized a staggering 51% average market price increase since the TARP program kicked in last October (see the current Preferred Stock Marketplace Snapshot chart on the Preferred Stock Investing Reader’s Forum), I was still surprised to see the Big Banks dip under the 9% new issue ceiling during May. The average yield being offered by the CDx3 Preferred Stocks from the Big Banks is now 8.9%. Utilities Have Non-Bank Revenue Source: Not surprisingly, utilities are in the best position to bring a new CDx3 Preferred Stock to market. They could currently do so by offering a new issue at about 7.5% - well within striking range. Why utilities? Remember, unlike other businesses, utilities are able to raise revenue through a rate hike to ratepayers. Assuming regulatory approval, utilities are more able to take on the cost of new capital without having to rely on commercial lenders. Under current conditions, this characteristic of the utilities industry means less risk to investors and, in turn, makes preferred stocks issued by utilities more attractive. Lower perceived risk results in higher market prices and, therefore, lower yields, for the highest quality preferred stocks from utilities in the earliest stages of an economic recovery. Of the four industries that are currently able to issue a new CDx3 Preferred Stock (below 9%), this chart implies that new CDx3 Preferred Stocks are most likely to come from the utilities industry. With the May 1 introduction of the new Third Edition of Preferred Stock Investing we also created the new Preferred Stock Investing Reader's Forum. The Forum is my online home where I (and others) post occasional research articles throughout the month regarding the marketplace for the highest quality preferred stocks. The Forum also includes daily articles from the financial press regarding preferred stocks, surveys that you can take and links to preferred stock resources and tools - all free to you. The latest feature of the Forum was activated a couple of days ago. You can now have new posts to the Forum delivered either (a) directly to your email inbox or (b) to your "feed reader" if you are using one to monitor other web sites. Visit the Preferred Stock Investing Reader's Forum, then look on the right side of your screen for the box with the "Get Daily Post Summaries Via Email" link. Also, you can post your own comments and questions to the Forum. 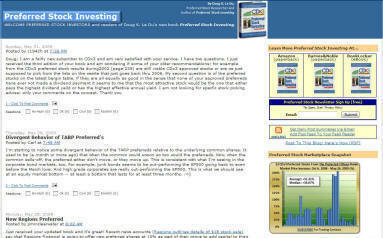 Read how to share your preferred stock investing experiences by clicking here. 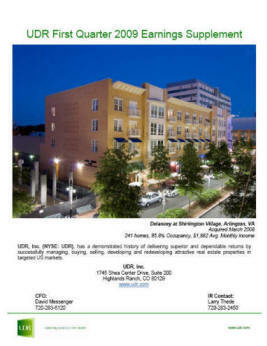 UDR, Inc., a S&P 400 company, is a $1.6 billion apartment developer and operator founded in 1949 and headquartered in Highlands Ranch, Colorado. As of March 31, 2008, UDR owned 44,571 residential and corporate apartment homes with another 2,046 under development. UDR's apartment communities are located and designed for middle-income families in popular markets throughout nine states plus the District of Columbia. On May 5, 2009 UDR announced its first quarter 2009 financial results, including a surprising positive revenue growth over the same quarter last year. Reflective of the slow housing market, apartments have enjoyed high occupancy and low turnover rates. UDR's rental income grew to about $161 million in the first quarter of 2009, up from about $127 million from the first quarter of 2008. Funds From Operations, a metric used by real estate companies that reflects their operating performance and is a better indicator of the company's cash-based performance (the calculation adds depreciation and amortization back into earnings) remained unchanged. Three of the twelve analysts covering UDR have upgraded the company to either Outperform or Hold since last fall. To see if there is a UDR apartment community in your city click here. UDR is an issuer of CDx3 Preferred Stock. When can I exchange my Citi preferreds for common stock shares? Pete J. In order to meet regulatory requirements, primarily those resulting from the May Big Bank "stress tests," Citigroup is having to raise $5.5 billion in new capital. In what is probably the largest preferred stock conversion in history, Citi has applied with the Securities and Exchange Commission (SEC) to convert privately held, publicly traded and government held preferred stock shares to common stock shares. Doing so will boost Citi's capital metrics well into the land of respectability that regulators are now looking for. The task of explaining the conversion to the investing public has been a bit convoluted and Citi has amended their proposed approach a couple of times. While the initial plan announced in February involved Citi's three "convertible" preferreds (C-I, C-P and C-M), the current plan (filed May 13, 2009) includes eleven "trust preferred securities." Further, the SEC has been slow to approve Citi's filing which has left many investors wondering what's going on. Just to add to the confusion, Citi's SEC filing identifies the eleven trust preferred stocks involved in their conversion proposal by the name of the issuing trust rather than by their trading symbols. The table at right will allow you to find references to your Citi preferreds in the filing. Only four of these eleven qualify as CDx3 Preferred Stocks. On May 12, 2009 subscribers to the CDx3 Notification Service received a CDx3 Flash email message from me regarding Citi's trust preferred stock conversion proposal. For the trading symbols of the four CDx3 Preferred Stocks from Citi, please consider subscribing to the CDx3 Notification Service. Citi's Conversion Plan Is Voluntary, Dividends Continue: An important aspect of the conversion for preferred stock investors who hold Citi trust preferreds is that Citi's conversion plan is voluntary. It is up to you whether or not to take Citi up on its offer to convert your trust preferred shares to Citi common stock shares. Secondly, should you choose to hold onto your Citi trust preferred shares you will continue to receive your dividends. The conversion program, once approved and implemented, will have an "expiration date" that is, at the moment, unspecified. Citi recommends that no less than five days prior to the (as yet unspecified) expiration date your broker should notify Citi's "Exchange Agent" that you are converting your preferred shares. There is also language in the filing that you must have held the preferred shares that you are converting on a certain date referred to as the "record date." Like the expiration date, the record date is also unspecified. The filing sets the price for your preferred shares at $23.75 per share. This is what caused the big run up in the market price of these Citi trust preferred stocks over the last several weeks. It is because of the missing expiration and record dates (that is, uncertainty) in the filing that the market price of these trust preferreds is not pegged at exactly $23.75 right now. Once the SEC approves the filing, Citi will publically specify the expiration and record dates. Subscribers to the CDx3 Notification Service will receive another CDx3 Flash email message making subscribers aware that the conversion window is open. If you are interested in converting your Citi trust preferred stock shares, keep in touch with your broker as the conversion window could open at any time. Thanks to Pete J. for the great question. You will receive a free copy of the CDx3 Special Report "Dividend Accounting." The 23-month long credit crisis has shaken our financial system and everyone who is invested in it (which is just about everyone). Even though the CDx3 Selection Criteria, day after day, have successfully filtered out the preferred stocks from every failed bank for almost two years now, and even though there has not been so much as a missed dividend for those who have invested in CDx3 Preferred Stocks, there's still some anxiety. As we enter the summer, there are several key events and initiatives that are going to directly impact preferred stock investors in the coming weeks. First, and most immediately, is the conversion of massive amounts of preferred stock shares to common stock shares across several of our largest financial institutions. This conversion will change the ownership composition of these banks. In the case of Citi, for example, common shareholders who currently own 100% of the company are going to own a mere 24% and the U.S. government is going to own 34%. Ironically, the biggest holder of Citi common stock after the trust preferred conversion is going to be former preferred stock holders, who never wanted to have a voting position to begin with. Accordingly to Citi's estimates, former preferred stock holders will own 42% of the company after the conversion. Second, watch for additional and/or adjusted plans from the stress tested Big Banks. These plans to convert preferred shares to common shares are being announced and/or modified at a regular pace now. I am watching these plans like a shark eyes raw meat. I watch, analyze and digest the SEC filings on behalf of subscribers to the CDx3 Notification Service and send out CDx3 Flash email messages to help clear up the confusion. You can do the work yourself or let me do it for you. But you want to stay on top of these plans and their impact on your preferred stock investments. This would be a great time to join the CDx3 Notification Service. Third, the SEC should announce new regulations in June intended on ending "predatory short-selling." This practice contributed to a near-run on about 100 of our largest financial institutions last fall and caused massive value losses for common and preferred stock holders alike. It got so bad that the government had to step in and stop the practice for several weeks until things calmed down. Short-selling is fine; predatory short-selling, when those who will benefit from a falling stock price spread false rumors around Wall Street to drive a targeted company's stock price down (including its preferred stock prices), is nothing less than dishonorable conduct and it needs to be stopped. And on the longer-term radar, do not forget that the Treasury's toxic asset sale program is set to kick off soon. The goal of this program is to get the "toxic assets" off of the balance sheets of the country's banks in order to free up cash for lending. The two-part program relies on banks selling these toxic assets to buyers at a discounted price. While several willing buyers have come forward, it is unclear that banks are as interested in participating. We should start to get a better idea if this program is a key recovery component or a non-starter in the weeks ahead.